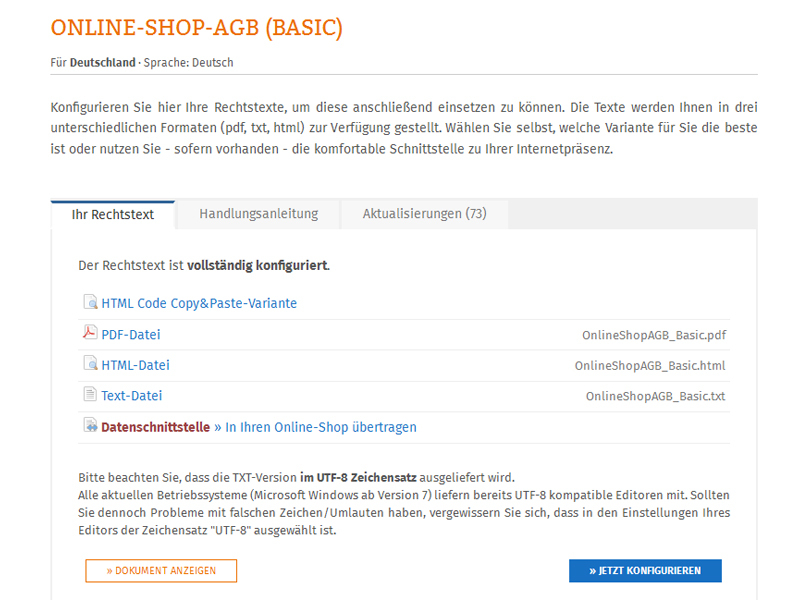 OXID eXchange | IT-Recht Kanzlei legal text service 2.0.0 | Stable | EE, PE | 4.7.x/5.0.x - 6.0.x - impressum | Module, Themes, Language Packs direkt herunterladen! The legal text service of the IT-Recht Kanzlei tailored to oxid provides you with dunning-proof texts constantly reviewed and updated by their lawyers specialized in lT law. After the one-click installation, the legal text interface monitors and updates automatically the legal texts in your shop and included in the scope of services - at no extra costs. You will be informed immediately, if the IT-Recht Kanzlei has registered an error regarding the legal texts, whether it is about transmission problems, damaged web pages or maybe a server failure after all. As other law firms we are as well liable within the scope of legal provisions that our legal text are dunning-proof.